Your Company is Only as Good As Your Weakest Employee. 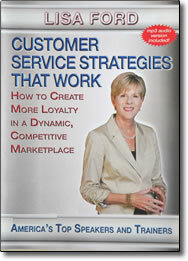 Your employees and their customer service skills may be the only thing that differentiates you from the competition. Customers are more sophisticated and educated than ever before. That’s why it’s critically important to make sure employee skills are constantly updated to meet ever-rising customer expectations. In this content-rich seminar, your front-line team members will learn practical skills and proven systems for improving customer service at every touchpoint, all along the cycle. They’ll gain numerous hands-on techniques including – how to listen attentively, uncover customer needs, calm down angry customers, win back disgruntled customers, handle conflict, and keep an attitude of “customers first” all day. Any organization putting these principles into action will quickly be out-servicing the competition.